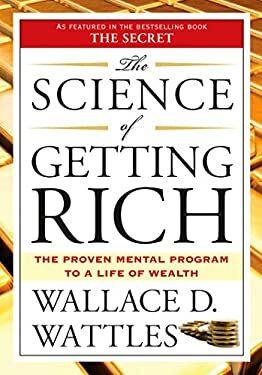 The Science of Getting Rich: Includes the Classic Essay "How to Get What You Want"
BUSINESS / SELF-HELP " Wattles offers techniques for getting in tune with one' s deeper self and thus creating a channel of communication between oneself and universal energy. His is a gentle philosophy that excludes competition, cheating, and lording it over one' s fellows when one has made it, and encourages cooperation." --Publisher' s Weekly In his bestselling book, Wallace D. Wattles explains that " universal mind" underlies and permeates all creation. Through the process of visualization, we can engage the law of attraction--impressing our thoughts upon " formless substance" and bringing the desired object or circumstances into material form. The author emphasizes the critical importance of attitude: only by aligning ourselves with the positive forces of natural law can we gain unlimited access to the creative mind and its abundant rewards.The Science of Getting Rich holds the secret to how economic and emotional security can be achieved in a practical, imaginative, and noncompetitive way, while maintaining a loving and harmonious relationship with all of life. By living in accordance with the positive principles outlined in this book, we can find our rightful place in the cosmic scheme and create for ourselves an environment in which to grow in wealth, wisdom, and happiness.WALLACE DELOIS WATTLES (1860-1911) was the author of numerous books, the best known of which is The Science of Getting Rich. He experienced failure after failure in his early life until after many years of study and experimentation he formulated a set of principles that, with scientific precision, create financial and spiritual wealth. He died a prosperousman in 1911.